Checking or the Quality Assurance & Quality Control (QA/QC) in process plant piping engineering and design is a grossly misunderstood activity that is performed (or should be performed) by every piping group on every process plant project deliverable. Problems arise when checking is not done and when it is done it is often done incorrectly. When it is done incorrectly not only the end result (the document) suffers but the designer who created the document suffers and the checker who does the checking also suffers. The document (the drawing or other deliverable) suffers because the "Check" was ineffective or incomplete. In some cases the checker "thinks" he or she is a better designer than the designer. So they turn the sheet over and redraw the configuration in "red" and send it to the correction group. The checker redraw is a document that in fact has never been checked. In other cases even after a normal check, mistakes may remain and this will cause another round of costs due to the re-checking, correcting (revision), approval, printing in the office to the cost of reissue handling in the field. The document creator (the designer) suffers because he or she gets blamed for every "red" mark the checker finds on a document. The designer's reputation suffers and they get the feeling that the "Checker" is out to get them. The truth is that most (if not all) of the "red" marks on a check print are in fact not the designers fault. They are more often traced to late changes to P&ID, vendor drawings or data from another discipline. The document checker suffers because he or she gets a bad reputation and people do not want to work with them. They do not learn to do it right so they keep making the same mistakes. As a checker you may ask the obvious question, how do you do it right? That is simple; when you (as a checker) find a "red" mark (indicating a mistake) you should dig deep and find out why is this "wrong." Is it really wrong and why? That is the real purpose of checking. "Why doesn't it work like this?" and the second: "Why is there so much animosity between the designers and the checkers?" These are both very good and very valid questions. The answer to both questions is the same. The answer is the lack of training. There is not now nor has there ever been proper training in what checking is or how to do checking. Before you did your first checking did anyone give you receive any training or any simple instructions about how to check or what to check? What kind of (checking) training should be given? Who should be given this (checking) training? The training given should include everyone in the piping design department. It must include the definition of what checking really is and what is the real target of the checking process. Checking is really the last stage in the process normally called QA/QC. QA/QC stands for Quality Assurance and Quality Control. QA or Quality Assurance is the things that are done ahead of time during job set-up to assure that things will be done a certain way. This includes filing systems, procedures, and specifications governing the work as it proceeds forward. QA is also the proper follow through during the work to remain in compliance with the procedures. Example, you set up a filing system for vendor data and the first drawings that came in got filed in their correct places. But later when revisions came in they got "lost" and were not placed in the correct file. This is not good. QC or Quality Control (Checking) is the verification of the product of all the accumulated data and work processes. Our business is the process plant engineering and design business. In the process plant engineering and design profession the deliverables are drawings. For the piping design department the deliverables include piping plan drawings and piping isometrics. The piping plan drawing (or the 3D model) is important but it is just a means to an end. The isometric is the end product and must contain all the information necessary to purchase the correct material, fabricate the piping configuration, and install the line or system complete with testing and check-out. The training for Piping Checking (QA/QC) should cover both the Purpose and the Process. Piping Design and the deliverables of the piping design effort is an important part of any process plant project and the checking of the piping drawings cannot be diminished in its importance. 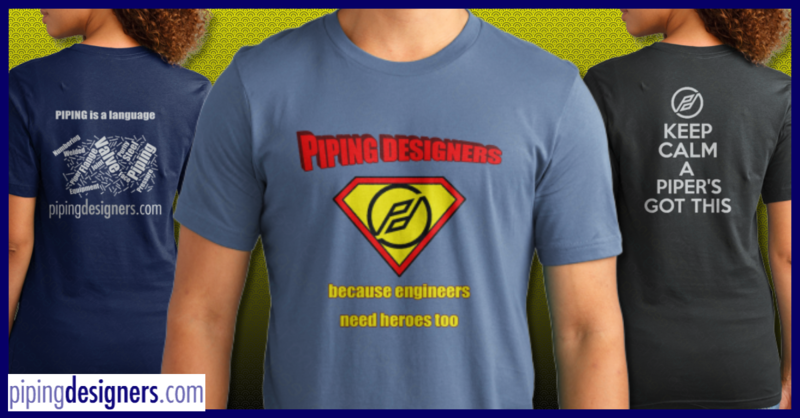 "Rule #1" all products and deliverables from the piping design group shall be checked. The Piping Design Supervisor for a project assigns the responsibilities for checking to one or more individuals. These "checkers" are held responsible for checking all (or a specific assigned group of) documents. These checkers should be well trained and well experienced individuals who can be fair, who can focus on quality and have a firmness of conviction. Defining what constitutes the source material for the assigned area. You may question "What does all this mean?" Let's take each of the items from this list and discuss them in detail. "Defining what is a checkable product?" This means that you should not spend hours/money checking work that is not ready for check. This is the responsibility of the piping design supervisor. If a drawing is not finished, not ready for check then it should not be placed in the checking group. A checkable product in piping would or should be all the piping plan drawings (or CADD models) and all isometrics that are complete. They have been through all the required reviews with all changes and comments incorporated. All activities involving other groups such as stress analysis, or instrument checks have been completed and comments incorporated. A checkable piping plan or isometric is a document that, in the absence of checking should be thought of as ready to go out the door. If it is not ready to go out the door then it is not ready to be checked. A checkable product is also a complete package of the check prints and all source material. "Freezing all work on the area that is in check"
This again this is the responsibility of the piping design supervisor. When all or a portion of an area is placed in the checking group for check then all work on that portion should stop. It makes no logical or economic sense to be changing what the checker thinks he or she is checking. Too often a checker will have a question about something on an in-check drawing and they go and seek a clarification from the designer only to be informed that "Oh, its not like that anymore." This shows that the product was not ready for check, or there is a lack of communication between the supervisor and the checker or that there is a lack of support by the supervisor for the checker and the checking effort. "Becoming familiar with the assigned area"
This is a joint responsibility of the piping supervisor and the checker. The checker (if done right) is someone who is totally new to the area being checked. This would be someone who has not worked on the specific assigned area drawings. They may even be someone new to the company or the project and as such they do not have the history of the area. The piping supervisor should provide (and the checker should demand) an overview of the area including the basics of the process, the operation, key maintenance issues and any constructability issues. "Defining what constitutes the source material for the assigned area"
This again is a joint responsibility between the supervisor and the checker. The source material to be used for the checking of the product (the drawing) should be the same material that was used when the last work was done to create the product (the drawing). Yes! There are times when a later revision of a source document (such as a structural drawing or an equipment outline) with changes will be received after the work was completed. These changes need to be reviewed by the piping design supervisor and a determination made as to whether the change requires pulling the drawings out of the checking group/process for modification. Remember checkers do not do the design. If the checker does the design then who checks the checker? "Obtaining a copy of the current revision of each of all source material"
Having a copy of all the source material is one thing. Having the latest copy/revision of all the source material is an all together different matter. The checker needs to check with each discipline that created the source documents to determine what the latest revision is. The checker needs to check with the group responsible for vendor data to determine the current revision of drawings for each applicable piece of equipment. Once this is done and correct and up-to-date copies are in hand the checker should review the revisions of these drawings against the revision used to prepare the "in check" drawings. If it is found there are differences then the piping supervisor should be notified and a decision as to the suitability for check should be made. "Using a set (or standard) checking procedure"
Using a standard checking procedure can be a company issue. Some may have very well defined guidelines for checking while others will have little or nothing. With or without the guidelines the checker himself or herself should follow a well structured and methodical procedure when checking piping documents. Piping documents as noted previously normally include piping plans and isometrics. The isometric is recognized as the defining deliverable of any piping effort. The checker should have a check list of normal things to check on the everyday isometric and any project specific items that exist. "Diplomacy between the designer who made the drawings and the checker"
This is a two way street. Both individuals should be motivated by the same goal. That goal is the accuracy of the information, the quality of the product (isometric), the reputation of the company and the interests of the client. With the proper attitude about the common goals there needs to be open and constructive communication between the checker and the designer whose work is in check. It would not be proper for the checker to "attack" the designer when seeking insight into why something was done a certain way. It is also not proper for the designer to rebuff the checker or be flippant with answers to the checkers inquiries. "Fairness when determining right from wrong"
This is the checkers responsibility. The checker is a checker for now on this job but on the next job they may be in a different position and making enemies by arbitrary decisions would not prove to be productive in the long run. When an apparent error is found the checker should try to find out where the "error" came from not who made the "error." What information did the designer use to create the document and what information did the checker use to check the document. There may have been a revision to the source information between the time the designer did the original work and the time of the check. Decisions about right and wrong should be made solely on the basis of the source documents and issues such as safety, functionality, operability, maintainability and constructability. When done with the checking the checker should sign and date the check print and forward it for correction. "Proper correction of the drawing(s) based on the checker's direction"
The proper correction of the drawings includes who does the correction and how the corrections are done. The first choice of who does the correction is the person who made the drawing in the first place. This is not always possible but where possible the originating designer gains insight as to mistakes he or she might have made, thus doing the corrections becomes a learning experience. When the originating designer does the correcting it affords a chance to catch items that the checker was not aware of that were deemed important to the original design. "How" the corrections are done is of even more importance. The corrector is to do the corrections completely and exactly as marked by the checker. When the corrector has an issue with a mark or change made by the checker then the corrector should discuss it with the checker. This conversation should be conducted with the proper attitude on the part of both parties. When done making the corrections the person doing the corrections should sign and date the check print properly. "Proper backing and support of the Piping Design Supervisor"
The Design Supervisor needs to remember he (or she) is responsible for all of what the designer has produced. If the design is bad then it is the Supervisor's fault not the designer's. The Piping Design Supervisor is the supervisor of all of the piping design not just the good stuff. Proper design supervision means that the Design Supervisor makes frequent and detailed reviews of what each designer is doing and how they are doing it. The Design Supervisor is also responsible for all instructions, data flow and communications effecting information related to the design work. Proper backing does not mean always taking the side of the checker. It does mean backing the checker when the checker is right. When there is an issue that seemingly cannot be resolved between a checker and originating designer, a corrector or anyone else, the responsible piping supervisor needs to get involved. He or she needs to determine the facts, review the supporting source documentation listen closely to both sides and make a decision consistent with the goals of the project. If all of this is done, and done consistently everyone involved will benefit. The most important one to benefit will be the company. They will have a better trained, better functioning design group and they will be more likely to get repeat business from satisfied clients.